Meringue Cookies are the PERFECT light and sweet cookies made with ONLY 5 ingredients, and bake in under 60 minutes! 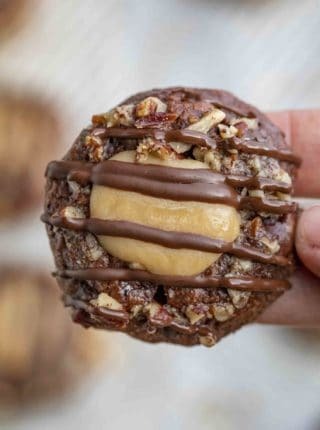 We’re always ready to bake our favorite cookies in this kitchen, and this week we’re making Turtle Cookies, Lemon Cookies, and our famous Chocolate Chip Cookies! Meringue Cookies are one of my all-time favorite dessert recipes, made with whipped egg whites and sugar, with a pinch of salt, cream of tartar, and vanilla extract. This is technically a French meringue recipe, because we’re just whipping the egg whites and granulated sugar together instead of cooking anything. 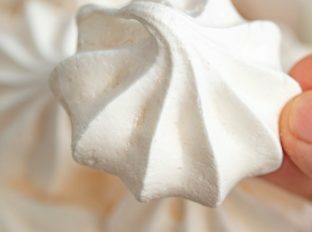 These meringues take a total time of 50 minutes to bake, plus some prep time to get the egg whites to form stiff peaks. You can make a lot of different varieties of these meringue cookies, like peppermint chocolate for the holidays, or lemon flavored for a lemon meringue pie! Meringue cookies start off very soft, and firm up as they cook. You can check to see if the meringues are done by touching them carefully to see if they’re firm. Watch to make sure they don’t start browning on the bottoms. WHY ARE MY MERINGUE COOKIES SOFT? 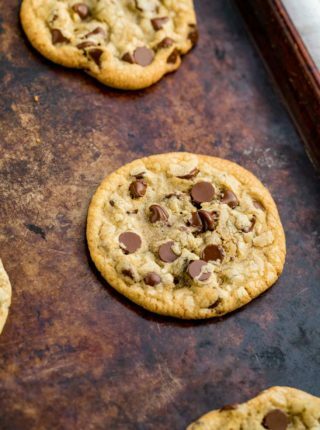 If your cookies are soft, it’s possible that they did not cook for long enough. Put them back into the oven to let them finish cooking. If they turn golden brown, you’ve gone too far. When they’re done, turn the heat off and crack open the oven door, and let the meringues cool in the oven. Your oven may also be cooking at the wrong temperature. Use a thermometer to double check that it is true to temperature. WHAT CAUSES MERINGUE COOKIES TO FALL OR CRACK? 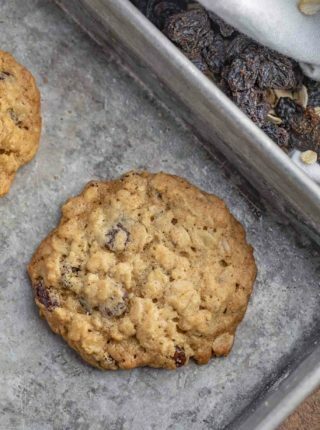 If your cookies have fallen or cracked, watch for these few simple things next time you make them. Make sure your ingredients are as fresh as possible. Older eggs won’t be as stable as fresh. Don’t over mix your egg whites, this can cause them to be less firm and the meringue cookies will fall in the oven. Let your meringue cookies cool in the oven after they’ve baked. If they cool too quickly, they won’t hold their fluffy texture. Meringue cookies should be stored in an airtight container at room temperature. These cookies should last up to 2 weeks. CAN YOU FREEZE MERINGUE COOKIES? 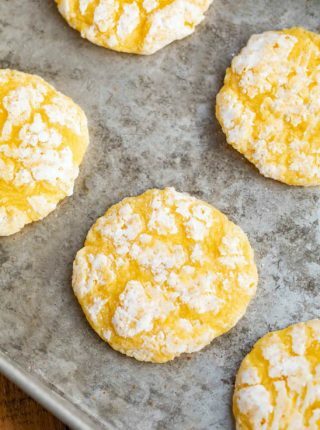 These can be frozen for 2-3 months, stored in an airtight container and layered with parchment paper between the cookies. This meringue cookies recipe can thaw on the counter for an hour or so before serving. 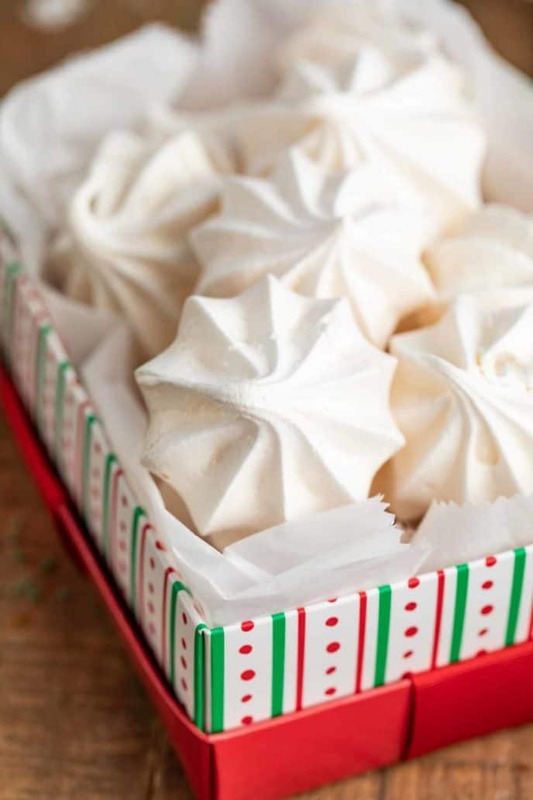 You can definitely flavor meringues by folding in additional ingredients right before piping them onto your baking sheet. Try cocoa powder, lemon zest, or cinnamon. You can also substitute the vanilla extract with other flavors, like lemon, almond, peppermint, or orange extract. Try to avoid making meringues on humid days. The extra moisture in the environment can make it more difficult to achieve the dry fluffy texture you need here. 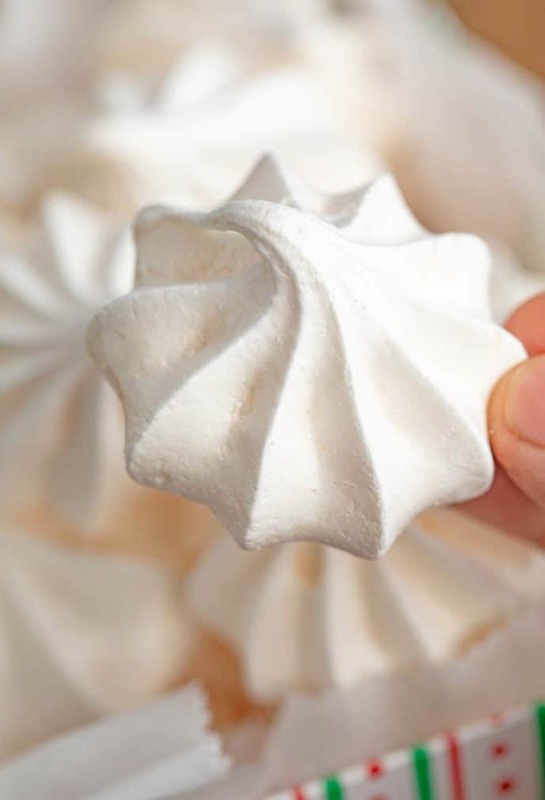 Meringues cannot tolerate fat or liquid, so make sure your bowl and mixer are completely clean and there’s no yolk in your egg whites, or they will not turn out right. Once your meringues are done cooking, you can dip them in chocolate and top with a sprinkle of cinnamon or cocoa powder. The cream of tartar helps the egg whites become more stable and form stiff peaks, so don’t forget this ingredient. It also helps to bring your ingredients to room temperature before starting. Don’t over-mix the egg whites or they won’t hold. Preheat your oven before putting the meringues in, or they may not cook correctly. Preheat oven to 250 degrees and line a baking sheet with parchment paper or a silpat mat. Place one cup of the sugar in your food processor for 30 seconds and process until the granules are much smaller. Mix the sugar with the remaining one cup of sugar in a medium bowl. In your stand mixer add the 8 egg whites on medium speed until foamy before adding in the cream of tartar and salt. On medium speed add in a spoonful of sugar ever 30 seconds then finally add in the vanilla (the mixture should be very shiny any stiff). Transfer in batches to a pastry bag with a star tip and pipe in a circle then spiral up onto itself . Bake for 50-55 minutes or until they just start to turn cream colored then turn the oven off but do not remove them or open the oven (I leave them in there overnight). These definitely looks so pretty. Haven’t ventured to make meringue cookies but looks like I Would soon. Thanks for the recipe and tips. You’ve got to try it! Enjoy! These meringue cookies look great! I love the tips you included. It has always been tough for me to get meringue right when baking! Thank you for sharing! Glad you found it helpful, Juli! This is one of my favorite ways to use up egg whites. Yours look perfect! I love all the tips you included. 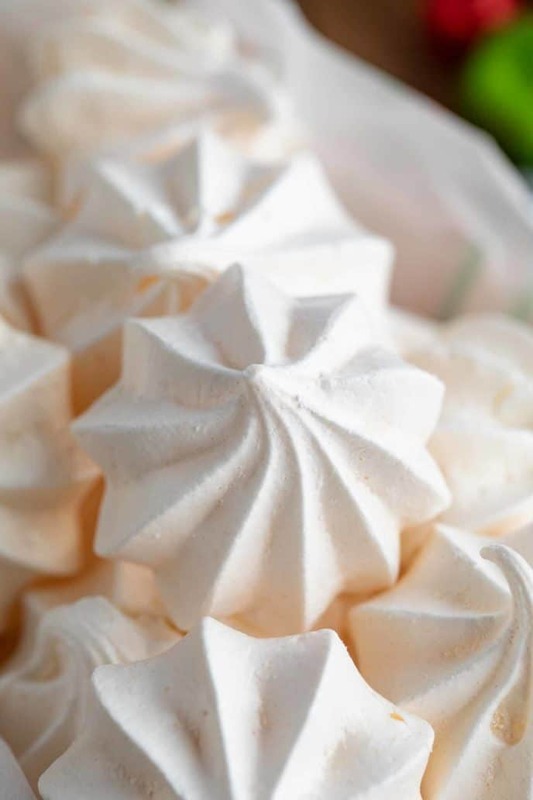 The lemon zest sounds perfect for these meringues, good tip! I love meringue cookies! Yours look so pretty, and I appreciate all of your tips and tricks!